This beautiful stitch pattern will make even a simple knitted project an outstanding one. 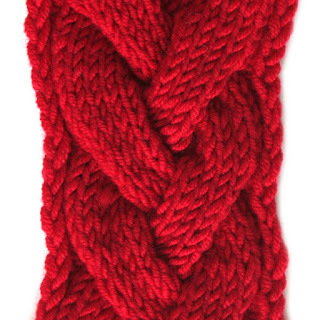 Made with a series of cable twists it looks exactly like a knitted braid. Cast on a multiple of 20 + 2 stitches. Add 2 selvage stitches if you want to make a nice-looking edge. Row 1 (right side): *p2, k18*, repeat from * to * to last 2 stitches, p2. Row 2 and every wrong side row: *k2, p18*, repeat from * to * to last 2 stitches, k2. Row 3 (right side): *p2, k3, 9 sts right cable, k6*, repeat from * to * to last 2 stitches, p2. Row 5 (right side): *p2, 9 sts right cable, k9*, repeat from * to * to last 2 stitches, p2. Row 7 (right side): *p2, k18*, repeat from * to * to last 2 stitches, p2. Row 9 (right side): *p2, k6, 9 sts left cable, k3*, repeat from * to * to last 2 stitches, p2. Row 11 (right side): *p2, k9, 9 sts left cable*, repeat from * to * to last 2 stitches, p2. Repeat rows 1-12 as necessary for completing your project. You can also work according to the chart available at http://www.knitca.com/cable8. All abbreviations are explained in the Key to Chart. I'm a begginer, I don't understand what "9 sts right cable" means. Are you trying to say that the next 9 sts have to cross to the right side? Sadly, the knitica link does not work. I haven't been able to find what a 9CF is anywhere :-( I know what an 8CF would be, but 9 doesn't make sense.